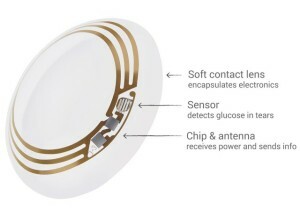 Google Smart Contact Lenses With Built In Camera. Earlier this year Google developed its invention of a smart contact lens that could monitor blood glucose levels through tear fluid. Now, the tech giant has invented another pair of lenses with a built-in camera. The lenses were developed in the Google X Lab and were featured in a patent filing dating from 2012, which was recently published by the US Patent and Trademark Office. The patent filing features a contact lens that includes an embedded circuit, camera and sensor. The control circuit could be linked wirelessly or via a wire to the camera and sensor. The sensor could be a light sensor, a pressure sensor, temperature sensor or electrical field center, which may allow for people to gain a “sixth sense” of sorts. While the project might seem a bit “out there”, the technology isn’t all that far off. Contact lenses with displays have already been tested in labs although they have been a little clunky up until now. One of the key benefits of having a camera embedded into a contact lens, rather than attached to the side of the head like Google Glass, is that the camera frame would allow a person’s precise gaze without obstructing their view. Perhaps an audio warning that there is a car approaching a junction for example. There may also be the option of go-go gadget eyes that have a zoom capability. OMG! What She Found In This Selfie Will Send Chills Down Your Spine!